It’s time to say goodbye…to American lunches for a while (at Falchi’s). I am lucky to spend it with my co-workers John and Crystal; they are separately awesome people, and together, it’s a bratty brother/sister vibe, which is often hilarious to watch. Main meal: Empanadas at Karu! Crystal had the pollo = chicken and egg, I had the carne = beef with egg, and John had the choclo = sweet corn & cheese. We all shared John’s verde sauce. “Slightly sweet but savory; the creaminess of the corn [juxtaposed against] the sweet of the corn in a pleasing way.” Thanks John. My stewed beef was a happy surprise; its tender mush texture, like a sloppy Joe, was seasoned just right, and the chopped hard-boiled eggs were a odd couple of flavors that worked very well together. However, the verde sauce was well needed. 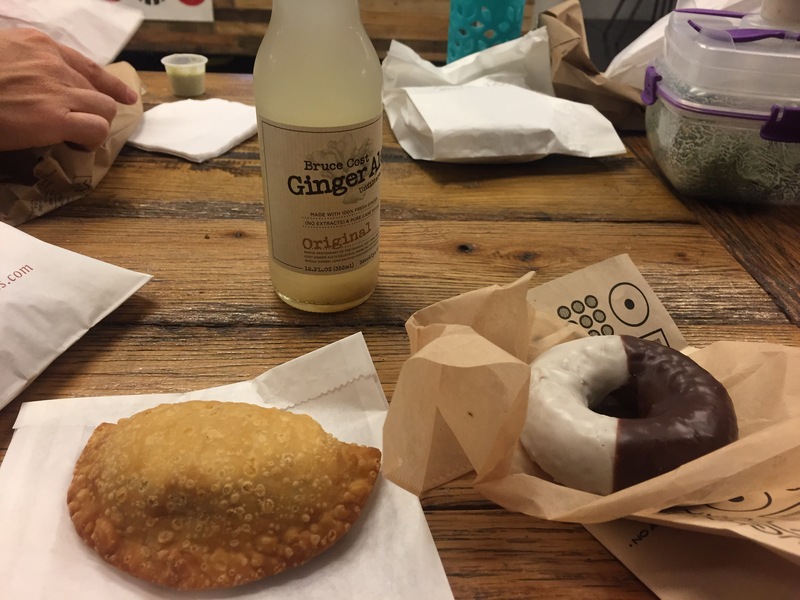 Crystal commented that the empanadas were “nice and fat; filled with good things.” Thanks Crystal! Then again, my mind is both here, enjoying a black and white cake doughnut, courtesy of the Plant, mirroring the iconic black and white cookie of NYC, and already thousands of miles away. Airport, plane flight, waking up across the ocean…at least it’s so nice to be amongst friends on the last day. “Their fried chicken is excellent,” I responded, hoping to attract another convert. John and Crystal quickly planned an outing to Rib in a Cup sometime next week. I realized this is why I do this: to get others excited about trying the food offerings in the area. I’m proud of doing my “job” today.